In the spring of 2001, a major structural rehabilitation project started on the Little Bras d’Or bridge in Nova Scotia, Canada. Built in 1959, the bridge consists of 1.2 meter by 30.4 meter (4 feet by 100 feet) steel girder spans and carries a two-lane, twoway highway. It was necessary to close one lane to perform repairs. Traffic flow was controlled by signals, and later, during peak traffic flow hours, by flaggers. As the project progressed into late spring, traffic volumes increased and motorists began to experience significant delays. Local residents, businesses, politicians, and emergency services were very vocal about the delays. Political pressure forced rescheduling the work for November of that year. In anticipation of the November bridge work, the Province’s transportation engineer started looking for tools to help predict the impact of the proposed closure to make objective decisions on when work could take place. QuickZone was used to analyze various staging scenarios. 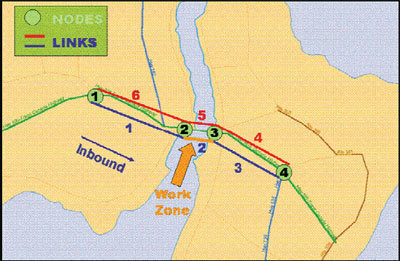 First, a baseline model was validated for queues and delays observed during the spring 2001 roadwork. QuickZone demonstrated that the planned move to November using the same traffic control would still result in unacceptable delays. Due to the QuickZone analysis and political issues, project completion was further delayed. Basic repairs were made to keep the bridge safely open until a better traffic control solution could be identified. In 2004, the initial analysis performed at this site was updated for a milling and repaving project on the same section of the highway. Estimates of capacity loss were updated based upon observations made at other sites. QuickZone was used to support the decision to do the work at night and also to define allowable nighttime work hours. It is anticipated that the structural repairs started in 2001 will resume and be completed in 2005 using an alternative traffic control plan. QuickZone enabled the quick testing of a number of alternate phasing plans to balance the need for the construction with the political pressure to reduce the overall impact on motorists. Engineers using QuickZone results minimized unacceptable delays in a work zone. QuickZone estimates of queue lengths and delays were consistent with field observations lending more credibility to the results of various alternate phasing plans.